We booked an apartment with Love Holidays and then 2 weeks later was told that the apartment reception was closed and could not accommodate 6 guests so could we change it. We asked for advice and Love Holidays recommended 3 other apartments so we booked this appartment! We were told that the pool would be open for kids and the reception was open. When we got there, the main office was closed! Also the number on the door didn't work, so we had to get a Spanish man to call it, it took us 2 hours to get the code to get a key then the code for the door. We got in and went straight to bed as it was 12 am by this time. When we got up we tried the shower and only 1 of us could get a shower as the hot water tank did not have enough hot water for us all. There were 3 adults and 3 teenagers so when we went to reception (which was open in the day) they said that's how it is..
Then we went to the pool and it was closed, so we asked about the pool and was told it was closed till Thursday. Come Thursday it was still closed and then told it would be open Saturday. Again, come Monday it was still closed. All we could do was sit on beach, but when we got back we had to have cold shower to get sand of us as no hot water AGAIN! The apartment was dirty, beds had ants, or some other black bug, I called Love Holidays up and they said it's a none refundable apartment so we had to stay there, or pay for new apartment for 6 people which would cost £580. Love Holidays are utter rubbish, do not book with them! We arrived in May '07. First impression of the building's exterior was very off putting. It looked dirty, and run down. Reception area looked like the interior of a pre- fab. hut. Our party had 2 x two bedroom apartments.The living quarters of the rooms were spacious, although the bedrooms were quite small. Please note that no kettles are provided. Only hand towels are provided. It took several requests during the week, to get additional towels. We had no hot water.When we reported this, they very promply had a new boiler installed. During the week, the other half of our party, had horrendous cockroach problems in their apartment. Their room was fumigated by staff. However, the bugs returned the next night. One was even found in a youngster's bed ! ugh! When we arrived the rooms were tidy but extremely dirty. Cleanliness is obviously not number one priority. We had to buy our own toilet paper and bring our own towels so be prepared! There was security outside every night which was good. Location was excellent. We were in the centre of everything..only 2 minutes to the beach. The staff at reception weren't very helpful as they spoke little English. I wouldn't advise that a family booked this place as it had little entertainment and the pool was dirty. Very much a young and lively apartment complex. Definitely visit again for the location but not for the standard of apartment..toilet wasnt cleaned once! Los Peces is Alcatraz without the security, anyone can walk in off the street and you dont know who you will meet on the balconies at night. There were 3 rooms broken into in 2 weeks and one mugging,one of the rooms robbed was ours and the door was kicked in. Some of the apartments are let to people who are not holiday makers and are very intimidating.It is no good putting things in the room safe as they just rip it out of the wardrobe. On the first night at the apartments we decided to go out for some drinks after a long day of travelling. When we returned 3 hours later our door had been kicked in and everything stolen. Money, clothes, cameras, even toiletries! In the morning a very rude woman who worked at the hotel came with the local Police to evict us from the room. She thought that we had kicked the door in ourselves and were lying about the robbery!!! I would never return to this apartment even if I were paid, it is what I imagine prison to be like. We had a 3 bedroom apartment as there was 2 couples & a friend. Apartment was plenty big enough, 2 bath rooms, kitchen wasn't brilliantly equipped. We had 2 hire a kettle which I thought was a bit much. If you are going to do your own meals take tin opener, corkscrew etc, also take your own towels cos the one's the maids leave are only hand towels. 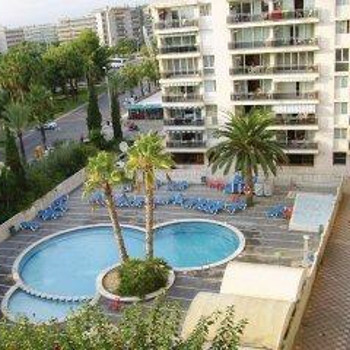 Excellent location, 2 mins 2 the beach, loads of bars near. Excellent food in the bar under the apartments. It's noisy on a night though, bin men collecting rubbish at about 4am. You can hear everyone coming home from the pub, then you can hear them re-opening the bar at 9am, putting tables out etc. The pools good, clean,there's an ice cream, drinks bar. BUT over the road is a hotel, can't remember it's name (it's blue) the pool is amazing, we strolled in several times.... Would book these apartments if I was going back. Stayed in the Los Peces apartments. Next to one entrance is an office which deals with a number of apartment blocks. Also has info on trips, Barcelona football matches and does money exchange. You collect keys and pay for safety deposit box here. You do have to pay 100 euro per apartment damages deposit which you get back at end. We paid in currency but noticed that if you ask as one couple did they will accept credit card imprint like hotels would. Staff could not have been more friendly. As we were leaving before office opening time (usually 8am) to travel to airport, they gave us 100 euro deposit back on the night before to save changing our taxi time. Had a 2 bedroom apartment on 2nd floor looking out over pool to the side of the apartments. Apartment bright and clean, although one bedroom could have done with a bit more light. Kitchen area had plenty of plates, cutlery, pans etc. Had 4 plate hob and a microwave/grill/oven combi. Plenty of towels supplied on day of arrival to last the week and even a tablecloth for the table! Balcony had table chairs and rack for drying small items of clothing. Plenty of shops, supermarkets and bars around local area. only 2 minute walk to promenade and nice clean beach and about 20 min walk (5 euros in taxi) to Port Aventura Theme Park. Would go back to these apartments. Stayed in these apartments for 1 week last year. We were in a top floor large 2 bedroomed apartment which was very basic. Some of these apartments are residential so they are nothing flash but is a good base if you are not going to be in room all day. They are in a very good location 2 min walk from beach and nightlife. Don,t think these apartments would be suitable for families with very young children as its right next door to a pub and is overlooked by to other large hotels which can get very noisy on a night. Overall I found these apartments cheap and cheerful and would stay there again.